This DIY describes how to inspect valve clearance on a 2007 CBF1000A Honda motorcycle and is applicable for 2006 to 2010 models. This inspection must be done every 24.000 km (16.000 miles). 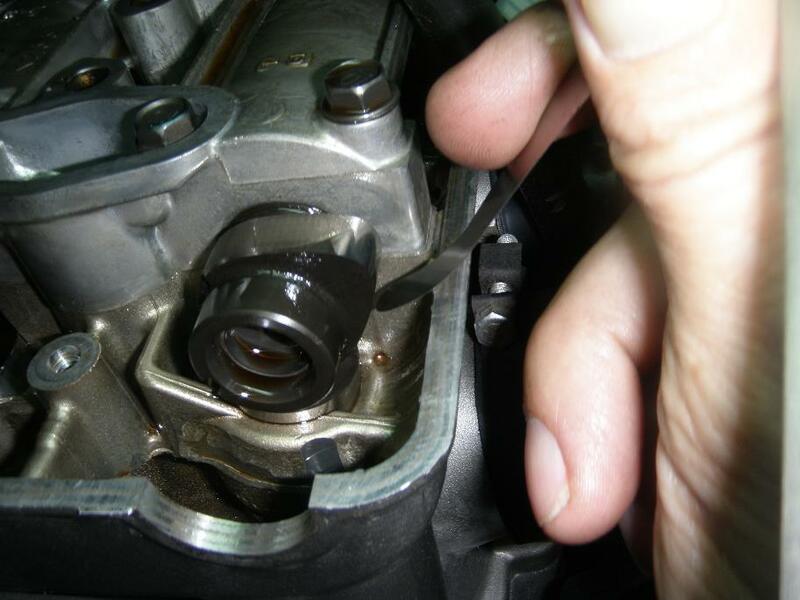 At the same time it is a good idea to replace spark plugs and radiator coolant, plus to do a few extra things, now that you have full access to do it. 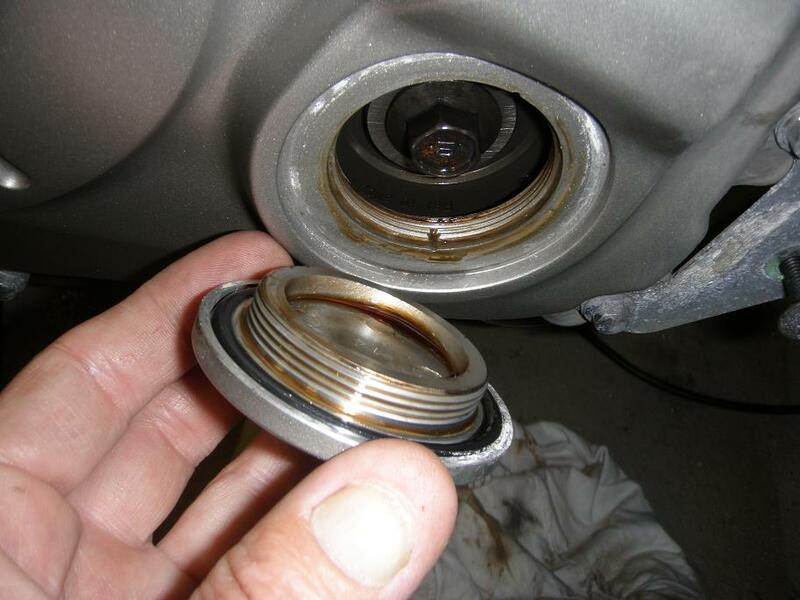 Most car engines have hydralic valve lifters which automatically adjusts the valve clearance, but on the CBF valve clearances are set using shims of selected thickness, and over many thousand kilometers the clearance may increase or decrease depending on how hard the engine is working. If the clearances become too large, ticking noises will be generated. If the clearances become too small, the valves will not close properly, so valves and valve seats will be damaged by hot gasses and compression will drop. In the later case there will be no warning of malfunction before severe damage occurs. It is rumored that some professional mechanics just listen to the engine, and if no valve clicking is heard, the inspection is finished!!! Hence you'ed better use a mechanic you trust, as a correct inspection (where you actually measure the valve clearances) is a time consuming work. This is not an easy DIY task. It involves quite many individual steps, some of which are a bit tricky and which - if not done with care - may damage components. 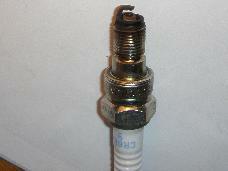 Especially the high tension spark plug leads, coils and caps are prone to be damaged if handled too hard. A first timer may spend 15 hours or more doing it, an experienced might do it in 5 hours. If you are a beginner in DIY, better have an experienced friend giving a hand. CBF1000A tool kit which was supplied with the bike. Socket spanners (7, 8, 10, 12, 14, 17 mm). Screw driver (pz 1, 2). Gauge blades (0.10, 0.15, 0.20, 0.25, 0.30, 0.35, 0.40 mm). Spark plugs: NGK: CR8EH-9 or DENSO: U24FER9. Copper washer for coolant drain plug. Coolant: 3 liters high quality ethylene glycol antifreeze containing corrosion inhibitors, 1:1 mixture with destilled water. Sealer: silicone RTV sealant (RTV = Room Temperature Vulcanisation). A spark plug alternative is Iridium NGK CR8EHIX-9 for longer life and, reputedly better performance, but I have no personal experience with these. I also have my doubts and concerns, because there is an old saying that "if something works, then don't mess with it". 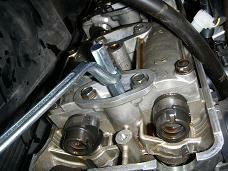 And I anyways recommend to use new spark plugs at each valve clearance inspection, so longer life is not of much use. Important: While the valve cover is off, be very very carefull not to drop any dirt into the cylinder head. Cleanliness is of utmost importence! 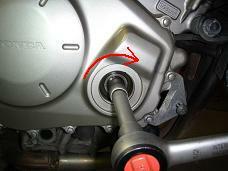 2.0 Remove the four spark plugs using the supplied tool. You will find that they are burried quite deep down in the cylinder head! The supplied tool has a small rubber ring which will grab around the plug, so the plug can be lifted up. Be sure not to drop any dirt into the cylinder or into the cylinder head. Inspect each spark plug as you get it up. The deposits on the spark plug will tell you how well the engine is running with respect to temperature, mixture ratio and oil leakage. See NGK's descriptions. 3.0 Remove timing hole cap and O-ring. 4.0 There are a total of 16 valves to check, 8 input valves and 8 output valves. They are checked in 4 steps, each with the cranck shaft turned to specific positions. 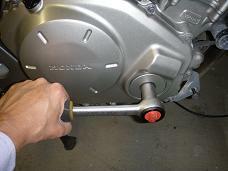 To reach the required positions, use a socket spanner to turn the cranck shaft slowly clockwise (and only clockwise!) until it reaches the correct position as indicated on the picture in each of the following sections 4.1 to 4.4 . Turn the crank shaft untill the "TIIF" mark is alligned with the notch in the one o'clock position and the "I" mark points straight down in six o'clock position. 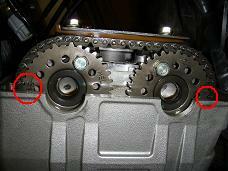 Then check if the "IN" and "EX" markings on the cam sprockets are alligned as shown in picture and drawing here below. 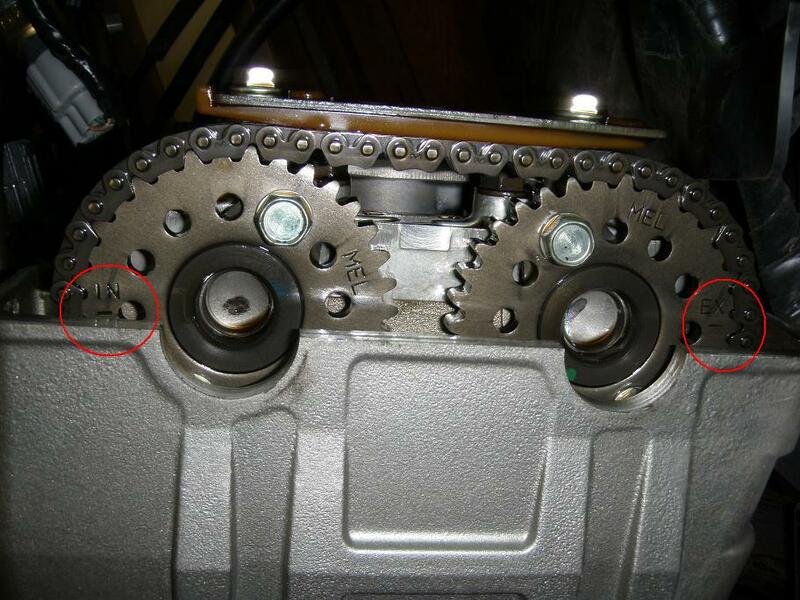 If the "IN" and "EX" markings are turning upside down and placed near the middle, you must turn the crank shaft one full turn extra to get them in th correct position. You are now ready to do valve clearance measurements in input valves I1L, I1R, I3L and I3R as shown on the drawing below. Insert a 0.10 mm feeler gauge into the gap at valve I1L (Input 1 Left). If you did not know why it is called a feeler gauge, now is the time for you to find out, because you will now have to train your fingers with the feeler gauge on this I1L valve gap untill you blindfolded can feel wether or not the blade can slide into the gap. The reason you must be able to do it like that is that most of the other valve positions are place so you can not see them directly. You litterally have to feel it. Furthermore - to be able to get into the narrow space I had to dismantle my set of feeler gauge blades, so as only to have individual blades and I also had to make a curved bending on the end of each blade, as clearly seen on the first image below. Now assuming the 0.10 mm blade can pass into the gap try with progressivly thicker blades, untill you can no longer get it in. Then note down carefully the thickest blade you could get in, and the thinnest blade you could not get in, e.g. like "I1L: +0.10, -0.15". The do the check again, to be sure you did it right. You may have to combine two feeler blades to get a certain thickness, e.g. 0.10 + 0.15 to get 0.25 mm. You can probably combine blades to achieve thickness in steps of 0.05 mm in the relevant interval, so how is it really possible to measure with the tight tollerances specified by Honda? Well - again it is something that you have to feel. Depending on the gap size you may find that the thickest possible blade inserts very easily, i.e. with little force. If so, note the result with a tripple plus sign like "+++0.30". If it inserts with medium force, note it as "++0.30", and if only inserts with difficulty write "+0.30". In this way you will know the actual gap size with a slightly improved resolution. 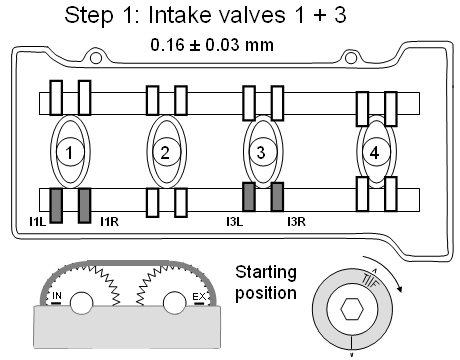 Now check the I1R, I3L and I3R valves in the same way and note down the results. Turn the crank shaft clockwise 1/2 turn (180 degrees) so the "I" mark points straight up. 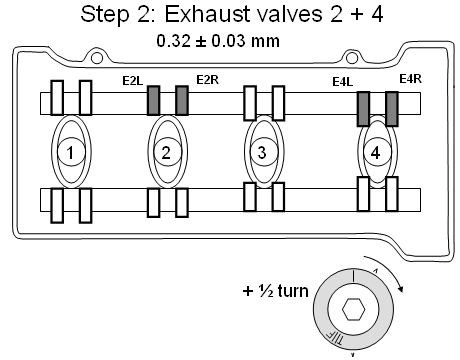 Check exhaust valves E2L, E2R, E4L and E4R and note down the results. The exhaust gap specification is 0.32 +/- 0.03 mm, so start with a 0.25 mm feeler blade. Comment: You might wonder why the exhaust specification calls for a larger gap than for the intake valves. This is most likely because the exhaust valves have to operate at higher temperatures and over a larger temperature range than the intake valves, and must hence have a larger nominal gap to ensure that there will actually be a gap under all operating conditions. The intake valves are cooled by the intake air, which due to the pressure drop (suction) in the input manifold may be 5 to 10 degree centigrades lower that the surrounding air temperature. The exhaust valves are heated be the hot exhaust gasses, causing the valve stems to expand in length, thus reducing the gap. 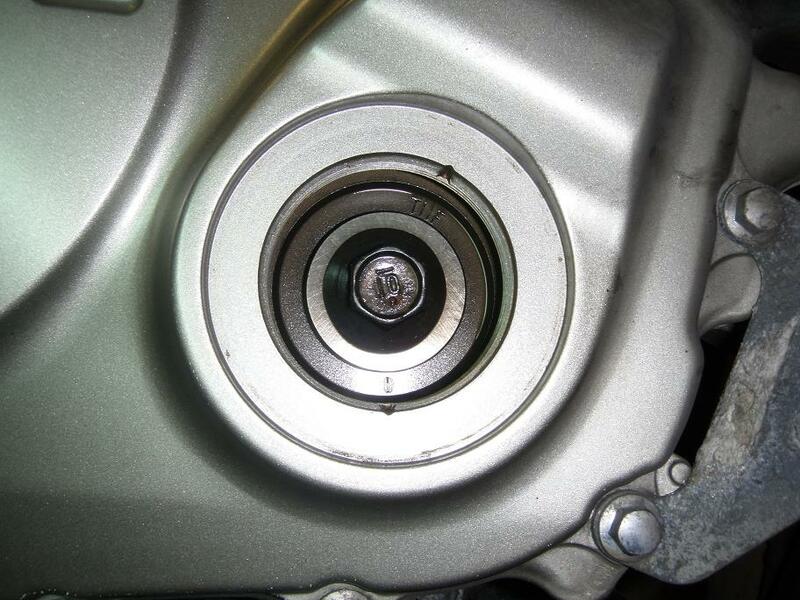 Turn the crank shaft clockwise 1/2 turn (180 degrees) so the "I" mark points straight down. 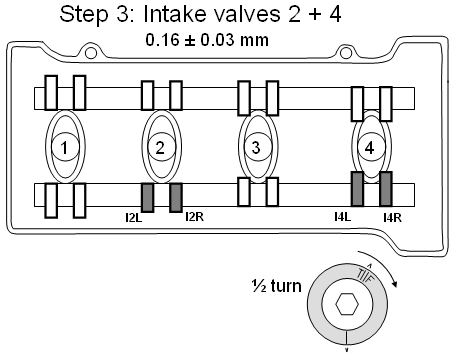 Check input valves I2L, I2R, I4L and I4R and note down the results. The input gap specification is 0.16 +/- 0.03 mm, so start with a 0.1 mm feeler blade. 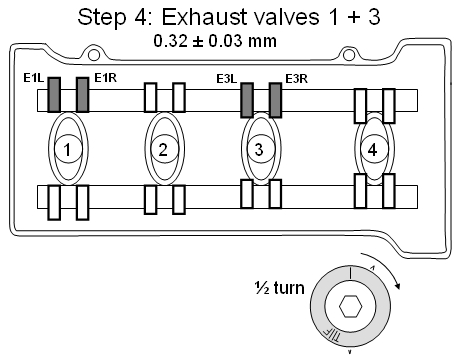 Check exhaust valves E1L, E1R, E3L and E3R and note down the results. The exhaust gap specification is 0.32 +/- 0.03 mm, so start with a 0.25 mm feeler blade. The table below shows my measurement results (in hundreds of a milimeter) taken at 27.000 km. If you have a micrometer, it is a good idea to calibrate each blade: Dip a blade in engine oil and insert it in the gap of the micrometer. Turn the micrometer to the nominal thickness of the blade and then pull out the blade. This way you will know which force is the right one to use for that particular blade. Here is a blank table for your measurement results. Assuming all the results are within specification, you can start assembling the bike again. 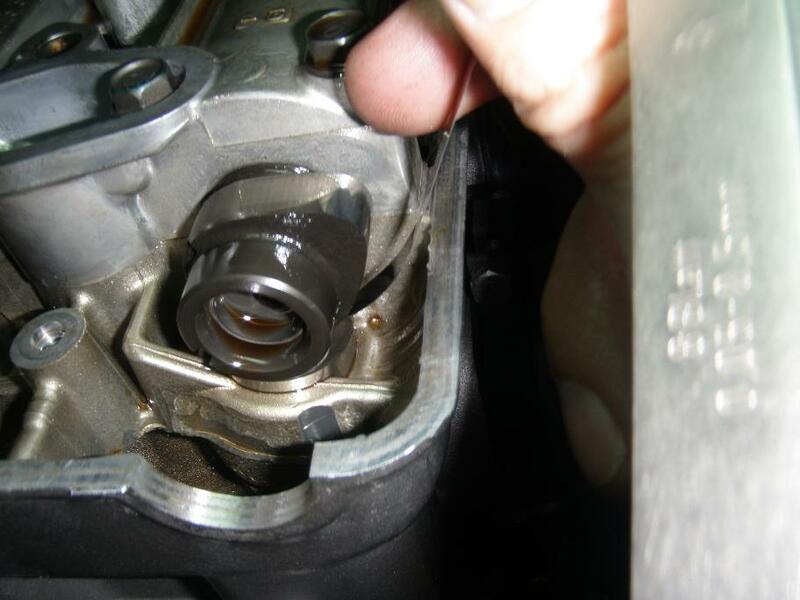 If any of the gaps are outside specifications, you must remove the camshaft for inspection and replace the relevant shims with thicker or thinner shims as appropriate. Or - you might put the bike on a trailer and take it to your local mechanic and let him do that slightly more complicated job. As all valve measurements were inside specified ranges on my bike (at 27.000km) I have not yet done this job myself and has hence not been able to write a DIY. 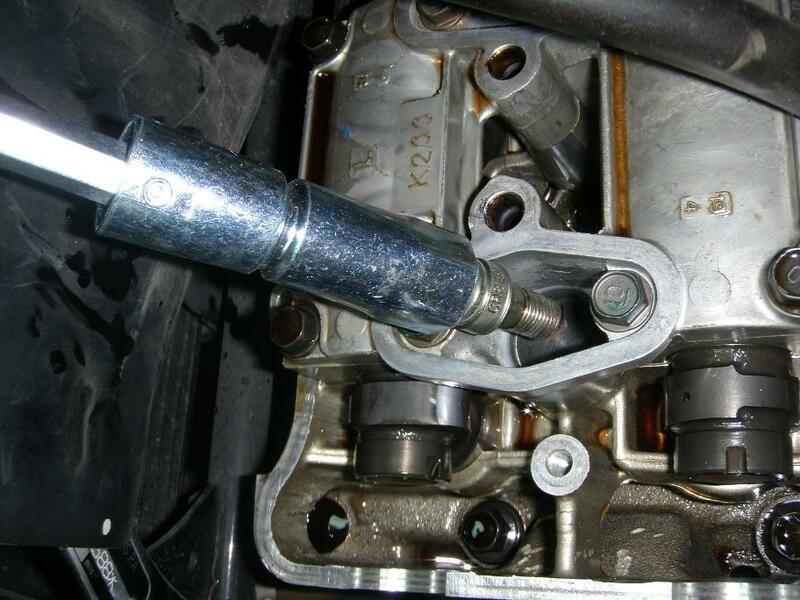 Fortunately - for all of us - bross from (www.cbf1000.com) has done the job and he has prepared this excellent Valve Clearance Adjustment DIY Article and given me permission to integrate it in this site. 6.0 Smear the timing hole cap O-ring with a little engine oil and the thread with some silicone greese and tighten the cap to 18 NM (1.8 kgfm, 13 lbfft). 7.0 Mount 4 new spark plugs. Most likely you will not have to revisit the engine top for the next 24.000 kms, so don't bother reusing the old plugs. You just risk having to dig into the engine top again sooner. Spark plug gap must be 0.80 - 0.90 mm. Adjust by bending them if required. When mounting the plugs, you may smear the thread with a small amount of copper grease or mount it dry as done in the factory as far as I know (see the discussion about this further below). And - most importantly - make sure the threads engage correctly without using anything more the finger force. Then tighten - still only with small force - untill the compression type sealing washer contacts the cylinder head surface. You can feel the resistance against rotation increasing sharply when this happens. If you are reusing the old plugs, be sure to clean the threads first and tighten to 16 Nm (1.6 kgfm, 12 lbfft), and slightly less if you used grease. If you are installing new plugs, the washer must be compressed correctly. This is done by turning the plug for about an extra half turn (180 degrees). The torque required for this will be stable around 16 Nm, maybe slightly higher, while the washer is compressing. Stop turning when the torque starts increaseing steeply beyond 16 Nm (slightly less if you used grease). Tip: Remember to smear the threads on bolts and screws with copper grease before you remount them. Then you will have an easy task, next time you have to disassemble. Exception is the timing hole cap where the threads are smeared with silicone grease. You may chose to dry mount the spark plugs or you may chose to apply a small amount of copper grease to the threads. There are different oppinions out there about what's best, so you must chose for yourself. Anyway you do it, be sure the threads are cleaned first if you remount old plugs. And never let the plugs stay put in the engine for too long a period or for too long distance. A small amount of copper grease ensures that the plugs will not get stuck over time, thereby preventing damage to the threads. And it will not significantly influence mounting procedure, maybe you shall just decrease the applied torque a little. Neither will it significantly influence spark plug operating temperature. If you are in doubt, look on the coloring of the plug tips (after quite some distance driving) to judge where you are on the self-cleaning line as per NGK's descriptions. The thread Valve Clearances on www.cbf1000.com may be used for comments and feed back, or you may mail directly to me (mail addres is on the front page).